The hype is SO ON. The week has finally arrived. The wedding bells are about to ring. Look who got invited… in her dreams! haha! Just like any girl, I’ve had my own fair share of sheer lunacy where I imagined myself as a princess with my own kingdom and a handsome young prince to boot — Prince William! My crush on him was so surreal that eventually, it was as if I developed a “crush” on the entire United Kingdom itself! Just because of one prince, I developed this whole new interest in EVERYTHING U.K. — British men and their accents (ahem! ), Harry Potter (haha! admit it, I just can’t CAN’T include that! ), their monarchy and parliamentary government, the pound sterling, the Union Jack, and whatnot. As long as it’s related to the U.K., I buy it, I dream about it, and I talk about it! The only thing left that keeps on getting postponed is for me to be able to experience ALL THAT firsthand! But anyway, thank God I’m a very patient person and rest assured, you’ll see a blog entry once I finally have MY trip to the U.K. Yeah, alright. Definitely. 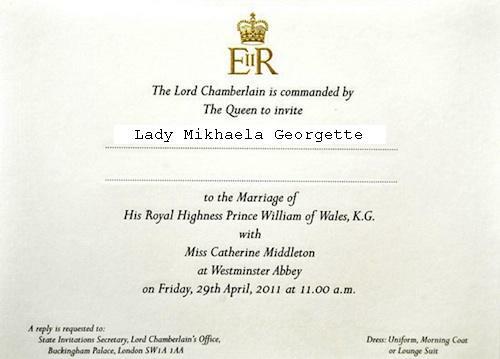 BEST WISHES TO PRINCE WILLIAM AND KATE MIDDLETON!!! Disclaimer: I do not own the photos and the video.